Source of wall maps for business for over 30 years. For custom business maps please send an email, subject line "map" with your specs & contact info then we can put together a quote and sample images for you. to verify or place an order. Choose from various maps of United States, USA Regions, and all the States. Map images of the World, Continents, and more...hi-res color maps-.jpg images. Impressive, attractive, sophisticated AND highly functional large size 8X5' U.S. map designed for professional office, marketing headquarters, transportation/distribution or executive boardroom. 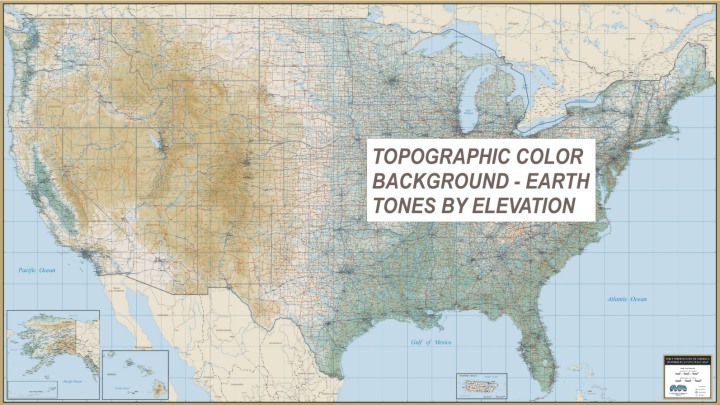 Choose pastel contrasting colors by state....OR... for the first time, (scroll down for Topo USA image) business wall map, high detailed, on an attractive topographic-physical color background by elevation... greens/browns ..a perfect business wall map for logistics, trucking, marketing, promotional sales planning and travel. Canada with their States, Provinces, Capitals & major cities- quite possibly the most detailed wall map available for the United States. ALSO AVAILABLE - EXTRA LARGE 142X88" shipped rolled and laminated IN 3 SECTIONS, with overlap on each piece for matching, to be assembled at your site. It is best to mount then trim in wood molding directly to wall space to frame this large map. specializing in business wall maps for over Thirty Years!